One of the Kickstarter projects I contributed to last year was for a book entitled The Lost Work of Will Eisner. Not surprisingly, it will feature some previously lost comics by Eisner. These lost works consist of the complete runs of the comic strips Uncle Otto and Harry Karry, the earliest known comic strips by Eisner. Syndication of these strips originally was pretty slim, and sporadic so only a handful of examples from actual newspapers had been uncovered previously. But with this package, we have complete runs of both strips thanks to the discovery of the original printing plates used to publish them. So what? Why bother with nearly 100-year-old comics that barely anyone has even heard of, and clearly had little lasting impression? I mean, studying Eisner's The Spirit? Sure, that makes sense. But Uncle Otto? We've all gotten along just fine for decades without knowing much of anything about it, so why bother? There are probably a number of reasons different people could cite, but I'm going to highlight this: Eisner's work didn't start fully formed. It came from somewhere. Eisner studied and practiced, just like every other artist. And like every other artist who studies and practices, Eisner's art and storytelling evolved. In looking at The Spirit and comparing that to PS Magazine and A Contract with God and Comics and Sequential Art and Last Day in Vietnam, we can see what Eisner learned and how he changed his approach to comic storytelling over time. What he learned through trial and error, through experimentation, we can learn through his examples. We can see where he tried things that worked and where he tried things that failed, and we can examine why. How was Eisner able to solve storytelling problems that have challenged other artists? 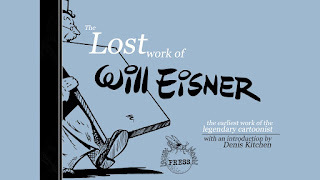 How did Eisner approach his work differently, and what did that mean for the final product? Looking at Eisner's earliest work adds to that examination. Looking at how Eisner drew comics when he was a teenager (he was probably 19 when he first started working on these) and then seeing where and how he went from that point to creating better and better comics. How it may have helped to lead him to creating the distribution of work methodology that corporate comics still use today. Maybe that's overselling it. Maybe we can't glean anything from Eisner's comparatively primitive work. Maybe it won't offer us any insights into his evolution as a storyteller, or the medium as a whole. But we won't know that without checking it out. Without sharing that with a wider audience of comics scholars. Without showcasing the work to a whole host of people who would never get the opportunity to see it otherwise. And that's why it's important.